I don't usually go in for most fashion magazines. I have a few years' worth of Nylon, for example, but I haven't bothered with it in a while, and I certainly don't care for Vogue (much of this has to do with my ambivalence towards most "luxury" brands, which are mostly just hype & mostly just boring). Vogue Paris, however, is something else entirely. 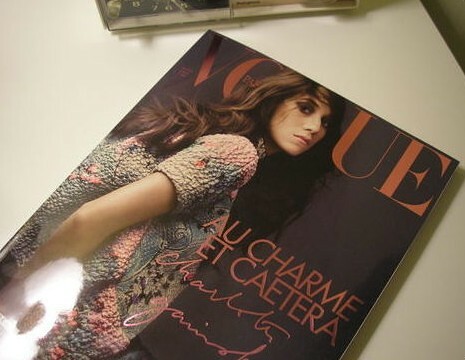 An issue of Vogue Paris with tens of pages devoted to Charlotte Gainsbourg, in fact, is heaven. I am not exaggerating at all when I say that my discovery of Serge Gainsbourg, when I was 15 years old, changed my life. It was my love of his music that lead me towards so much of what I love, and towards the development of my taste. The first song of his that I heard was "Ford Mustang," and I still adore it. I have always admired his daughter. Charlotte Gainsbourg & her mother Jane Birkin are my personal style icons. While I do not have their wonderfully long and svelte limbs (not to mention their gorgeous hair), when I close my eyes and think of the perfect outfit, it usually involves trouser-leg jeans and a pretty blouse, and hair pulled into a messy bun. Something effortless, something chic, something very Jane and/or Charlotte. As far as I am concerned, Charlotte Gainsbourg is the most beautiful (famous) woman in the world, particularly because she is so effortless, and because she has one of those faces that is perfectly composed of prettiness and plainness. I am not fluent in French but ah! What a treat the language is. Another wonderful thing about the magazine is that it came with a wall calendar for 2008, and a saint's feast day is listed for every day.